Six years ago, I wrote a piece for Worth on a small maker of mid-century modern furniture and lighting called Smilow Design. I loved the intelligent design of their work—sophisticated but playful, of a time yet timeless, crafted for an era when designers aspired to create beautiful things at reasonable prices for middle-class people. It was optimistic furniture. I also had a personal reason for writing about the company. Judy Smilow, the woman behind it, had grown up in Usonia, the mid-century neighborhood in Westchester, New York, where I live. Frank Lloyd Wright designed Usonia in the late 1940s, and the 100-acre swath of isolated, wooded land became a haven for creative types—architects, sculptors, writers, teachers, scientists, engineers. Judy’s father, Mel Smilow, was one of the country’s foremost designers of mid-century modern furniture until his death in 2002. The Smilows lived down Usonia Road about a quarter-mile from the home that my wife and first son and I moved into in 2013. (Our second son joined us—and the world—the next year.) The Smilows’ dramatic, minimalist home began embedded in a hillside and then cantilevered out over the ground below, seeming to defy the laws of physics and common sense. It must have been an exciting place in which to grow up. When the family sold the home after Mel’s death, Judy and her sister Pam discovered an unknown cache of their father’s designs in its basement. Judy, herself a graduate of the Parsons School of Design, had since made it her mission to bring Mel’s furniture back into circulation, painstakingly seeking out American artisans who could make the furniture in small quantities of excellent quality—no easy thing, given how much of the American furniture industry has been wiped out by low-cost manufacturing in Asia. It took some time, about a decade, to launch Smilow Design, but she had done it. 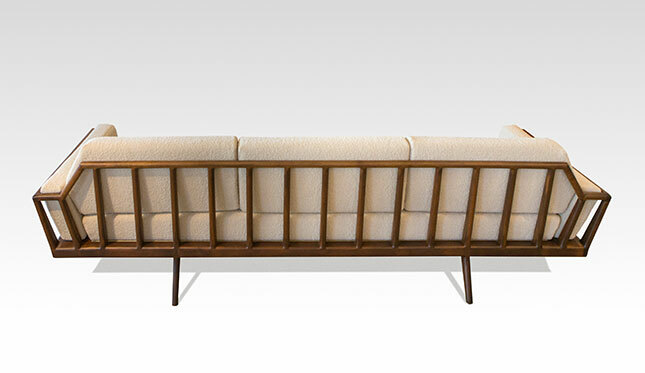 I instantly became a fan of Mel Smilow’s designs, particularly this rail back sofa made out of solid walnut. It’s the kind of whimsical yet functional furniture that they don’t make anymore—except now they did again. Mel designed it in 1950. Has a more beautiful sofa been fashioned since? But even more than the furniture, it was Judy Smilow’s passion that attracted me to her story. She was never going to make much money from these pieces, which now cost far more to build than they would have when her father designed them. Instead, Judy was driven by a desire to preserve and extend her father’s legacy. Within about five minutes of meeting her, I liked her immensely; she was creative and smart and funny and warm. And one other thing—vulnerable. It was as if she was slightly self-conscious, starting a business that was so personal for her. After the article was published in the November 2013 issue of Worth, Judy and I stayed in touch occasionally. She’d send news of Smilow Design, and I’d tell her this and that about goings-on in Usonia, even though she knew the community far better than I did. I’d only been there a couple of years. 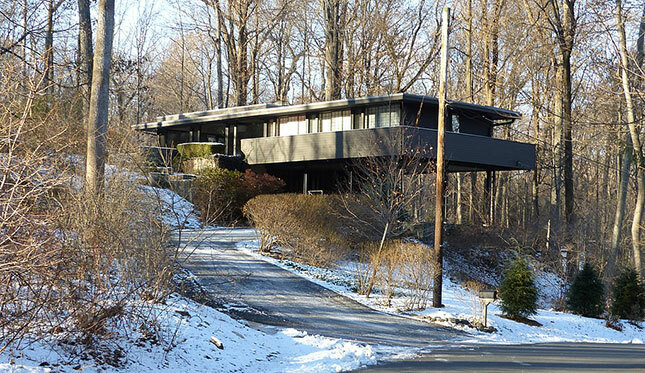 She was second-generation Usonian, shaped by the neighborhood in a way that I would never be. I assumed that one day we’d both have time for longer conversations. Then, on July 27 of last year, I received an unexpected email from Judy. “Dear ones,” it began. In the last six years, it has been my privilege to get to know so many of you wonderful talented inspiring people who have gone out of your way in small and big ways to help and support me in achieving my wildest dream—Smilow Furniture / Smilow Design. It is with heavy heart but also full and grateful heart that I am writing you today. Two years ago I was diagnosed with ALS. For some this may be shocking news but for others it will explain what was happening if you saw me over the past two years as I slowly went from foot trouble, to cane, walker and now wheelchair. Lucky for me, the decline has been fairly slow (by ALS standards) and I have been able to keep working and growing Smilow Design, which all of you know, has been my great love and passion since 2012. Many of you may also know that my first passion was first and foremost to resurrect and further establish/cement my beloved dad’s legacy. What you may not have known is that it was also a big part of my dream to pass the baton to my children. I could not have had a more thrilling ride! I am grateful for every minute of my journey. It seems that the time has come for me to step back from the daily operations of the business. I feel confident in knowing that throughout the last two years we have been carefully planning and preparing for the business to thrive and continue without me. Please know if you are receiving this email that I consider you a part of my success reintroducing this brand. I thank you from the bottom of my heart. …It has been my privilege to get to know every one of you. That email hit me like a shove. This was the worst news, and I wasn’t feeling strong to start with; I was struggling through a divorce. In fact, just days before, I had signed the separation agreement, signature and date, three times on each copy, six copies—why did the lawyers need so many copies?—that sealed the end of my eight-year marriage. My wife—ex-wife—did not want to live in Usonia anymore. Didn’t want me, didn’t want the memories, didn’t want the house. Maybe that’s why my home in this small enclave felt so essential. So much goddamn loss already. Two weeks later, my ex-wife would vacate the premises, leaving behind holes in the walls where her pictures had hung. What does one say after a shove? …I am so very, very sorry to hear this news. I will be thinking of you and your family. And if it’s possible, I would love to come see you to say hello and thank you for giving me the chance to write about Smilow furniture. Would that be all right with you? After a couple of days, Judy replied, thanking me again for having written about Smilow Design. How wonderful for me and you that we are also connected through Usonia. I’d be happy to see you…. Not long ago, I got an email from Steven Schoenfelder, Judy’s husband of 32 years and the owner of an eponymous graphic design firm. Steven and Judy’s daughter Maia and sone Aaron are now running Smilow Design, and the company was introducing a new product line, Smilow Glass. Well, not quite new—Judy had first founded Smilow Glass in the 1980s, when she was working as a product designer. 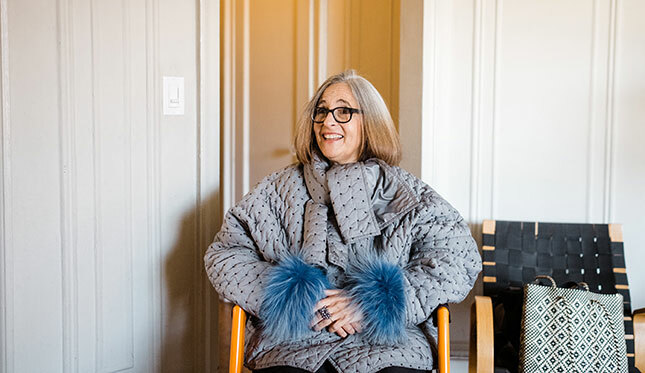 She was very talented; her glass designs, including plates and drinking glasses, are in the collections of the Brooklyn Museum, the Cooper-Hewitt National Design Museum and the Yale University Art Gallery. Steven and Maia are bringing back some of Judy’s glass designs, including the Dots and Dashes collection. 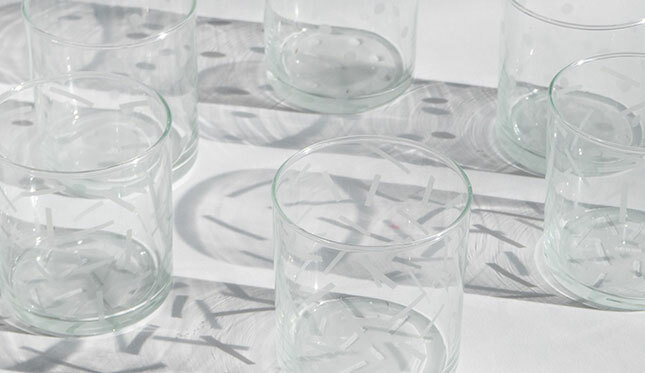 These glasses—simple, playful, emblazoned with, yes, dots and dashes inspired by a sandblasting technique Judy created—felt to me like something out of Mad Men, that era when everyday objects were so functional and cool. But they were not so retro. As Judy explained in a 2017 email to Yale professor John Stuart Gordon, author of American Glass: The Collections at Yale, her inspiration came from the Japanese concept of shibusa, “which has to do with simplicity, with depth and economy of means, an intelligence and imagination of design.” The glasses weren’t mid-century modern. Instead, Gordon explained in his book, they manifested the “visual excitement of Postmodernism”—the next generation of thinking about design, art and architecture. So there are different ways you can consider these glasses. They are utilitarian, of course. 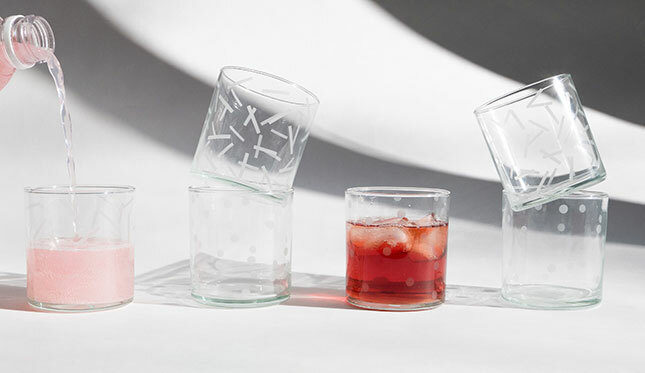 I think they’d be an excellent cocktail glass for outdoor drinking in summertime. But they are an aesthetic pleasure as well—simple, fun, almost innocent. And, if you’re interested, they are a crucible of a design tradition, the product of generations of thinking about the interplay of form and function. For me, though, this glassware embodies the intelligence and creativity and playfulness and passion that Judy Smilow poured into her work and her life. It’s a fitting way to remember her. For more information, visit smilowdesign.com.